The King of All Enhancements? 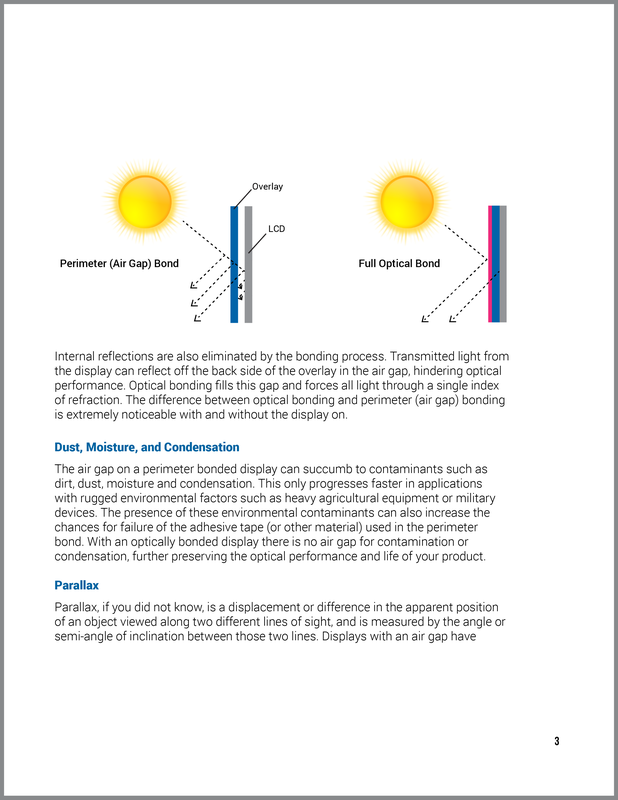 Optical bonding is the lamination of the LCD surface to a touchscreen overlay, optical filter, or other protective cover layers to eliminate the air gap. Bonding is done using materials such as silicone, urethane, and epoxy. Touch International is a DuPont Vertak™ licensed bonding facility and uses the Vertak™ UV-curable adhesive in most applications. However, we are experienced and qualified to provide urethane and epoxy bonding as well. We pride ourselves in a high yield, a quality controlled process that delivers products with exceptional fit and finish. What benefits can optical bonding provide? How can optical bonding help viewability? How can bonding help my product in a rugged environment? Can I combine bonding with other enhancements? Is optical bonding good for my sunlight readable application? Optical bonding: The King of All Display Enhancements?